It's hard to believe that I haven't posted anything here in six months. Would you believe that I haven't even sewn anything in almost six months?!? It makes me a little sad when I think about that, but I'm getting ready to start sewing again! I have two good reasons: a new baby coming in the next month (my sister's) and my need for a new bag (always a good reason to sew ;). I'm planning on my usual family baby gift for my sister: a baby quilt, one of my embroidery hoop birth announcements, and my tumbler stripe blanket. My go-to baby gift for my family members. 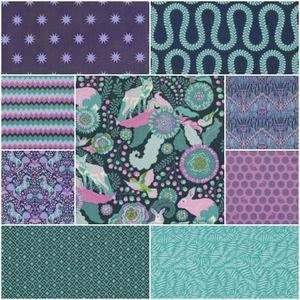 I haven't decided on a pattern yet, but I'm partial to patchwork, so I have a feeling that may be the direction I'm heading. As for a bag for me, I wasn't interested in making one for myself (even though I've been looking and looking for a bag to buy and haven't been able to find just the right one) until I saw the Sidekick Tote that AnneMarie of Gen X Quilters made, then I got a little giddy about the idea of sewing a new bag. I even picked up some gray mochi dot linen just in case the mood strikes and I feel like getting started. I think I'm even going to pull out some of the fabric I've been hoarding and use it on this bag. In other news, I've recently been contacted by two home-based sewists who are interested in selling my pencil-shaped pouches at craft fairs, in their Etsy shops, etc. 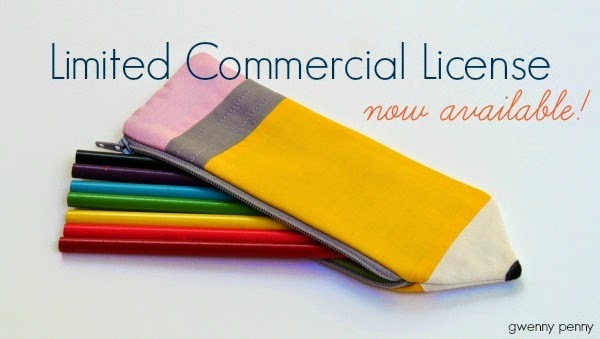 I have decided that I will be selling a Limited Commercial License to people who are interested in using my pencil pouch tutorial to make pouches to sell for profit. I will be posting the details and a link to the terms and information tomorrow morning. Thanks to everyone who is still out there reading my posts. I know they are infrequent, but I still love this blogging community and miss the interaction and my friends.